Kalamazoo, MI: The Kalamazoo Department of Public Safety is currently looking for a missing person who was last seen in the 700 block of Douglas Avenue on the morning of Saturday March 25th 2017. Mr. Elishiba Lashawn Thompson suffers from health issues and hasn’t taken his medication since Saturday. 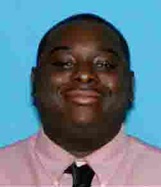 He is best described as a 27 year-old, B/ M, 5’ 11” / 220 lbs., with short black hair. He was last seen wearing all black clothing with white writing on his right pant leg and blue or black sneakers. If you have seen Mr.Thompson or know of his whereabouts please call the Kalamazoo Department of Public Safety at 269-337-8994 or 911. On 3-31-17, KDPS and Kalamazoo County Sheriff’s Department did an extensive search for Mr. Thompson in the area of 10th St and H Avenue. Thompson was not located but he was last seen in this area a couple of days ago. Once again, Mr. Thompson suffers from health issues and hasn’t taken his medication. We are asking for citizens in the 10th St. and H Avenue area to be on the lookout for Mr. Thompson. If you have seen Mr. Thompson or know of his whereabouts please call the Kalamazoo Department of Public Safety at 269-337-8994 or 911. Kalamazoo, MI: On Saturday, October 8, 2016, at approximately 8:09 p.m., Kalamazoo Pubic Safety Officers responded to the area of Douglas Avenue and Summit Avenue for a citizen reporting a man threatening people in the area with a handgun. Public Safety Officers responded to the area and observed the male in question walking on Douglas Avenue. Officers made contact with the man suspected of carrying a gun, and during this contact the man admitted to being in possession of a loaded handgun. Although the man was illegally possessing a handgun, he complied with officers and was cooperative, making the potentially dangerous situation safer for all involved. As a result of this investigation the man, a 30 year old Kalamazoo resident was arrested and charges of CCW and Possession of Marijuana are being sought. He was lodged at the Kalamazoo County Jail. Once again Kalamazoo Department of Public Safety would like to reiterate that through collaboration with community members and stakeholders such as this one, we as a city will continue to reduce crime, build and maintain trust, and provide the most efficient, effective, and professional public safety services available. Anyone with information about this incident is asked to contact Public Safety at 337-8994 or Silent Observer at 343-2100 or www.kalamazoosilentobserver.com. KALAMAZOO, MI: On Sunday, October 2, 2016, at approximately 0400 hours officers responded to the area of Douglas and Paterson for an unknown accident. The caller reported that a vehicle had crashed and was upside down. The first arriving officers located one lone male occupant trapped inside the vehicle. The male inside the vehicle had visible injuries however remained conscious and alert as officers utilized the hydraulic tools from the fire engine to pry and cut an opening into the vehicle. Once there was access into the vehicle, the male was able to maneuver himself away from the back window and out through the opening created. Officers and LIFE paramedics assisted the male into the ambulance where he was taken to Bronson Hospital for further treatment. Charges are being sought against the 23 year old Kalamazoo resident for Operating While Intoxicated and Driving without a License. Kalamazoo, MI: On July 23, 2016 at 1527 hours, the Kalamazoo Department of Public Safety responded to the scene of a single motor vehicle crash at the intersection of Cadillac and Douglas. PSO Chelsea Parise was immediately on scene and reported that a vehicle had struck a tree with enough force to turn 90 degrees in the air and land onto a nearby unoccupied parked car. The passenger, self extricated himself from the vehicle and was transported to a nearby Hospital with minor injuries. The driver, a 26 year old resident of Kalamazoo, had to be extricated from the car. Once the driver was released from the wreckage, he was transported to a nearby hospital with serious but non-life threatening injuries. The driver, who was driving on a license which was suspended indefinitely, stated he was operating the vehicle with the knowledge that the brakes were not functioning properly. The driver lost control after accelerating down Summit Park and was unable to stop at the stop sign; the car struck a tree head on which caused the vehicle to spin through the air landing on the parked vehicle on Cadillac Street. The Kalamazoo Department of Public Safety encourages all motorists to have routine inspections and maintenance on their vehicles.